Headed anchor bolts are different from bent anchor bolts or anchor rods, because the non-threaded end has a forged hex, heavy hex or square head. The headed end is embedded into concrete foundations to secure structural steel columns, light poles, bridge rail, and substation structures. Available specifications include, but are not limited to, ASTM F1554, A449, and A307. Portland Bolt manufactures headed anchors from 1/2″ through 2-1/2″ diameter in many different ASTM specifications. They are provided either plain finish or hot-dip galvanized. The following sizes and finishes are stocked at Portland Bolt under the given part number. 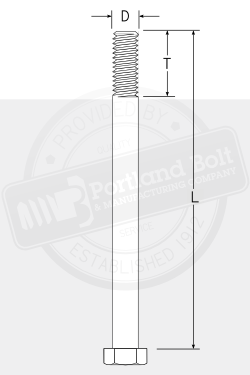 Portland Bolt stocks these F1554 grade 36 hex head anchor bolts that are ready for immediate shipment. These hex bolts have a forged hex head and are not a rod with a tack welded nut. We stock a wider range of F1554 grade 36 headed anchor bolts in a hot-dip galvanized finish than in a plain finish. Galvanized anchor bolts can usually be substituted for plain finish anchor bolts, especially when a quick delivery is required. If substituting a galvanized anchor bolt is not acceptable, Portland Bolt can always manufacture F1554 grade 36 headed anchor bolts in a plain finish. 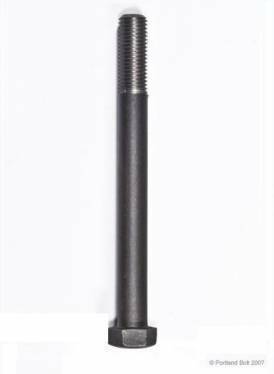 All stock F1554 headed anchor bolts have a 6” thread length. Portland Bolt stocks both F1554 Grade 36 and F1554 Grade 55 hex and heavy hex head blanks (round bar with a forged head) in lengths of 36”. These blanks can be cut to length, threaded, and galvanized (when required) very quickly. Blanks are perfect for manufacture relatively small runs of custom sized F1554 headed anchor bolts with very short lead times. For more in-depth technical information about the F1554 anchor bolt specification, visit www.f1554anchorbolts.com which includes summaries for grade 36, grade 55, grade 105, configuration information, nut and washer compatibility, application information, frequently asked questions, and even an F1554 anchor bolt quiz! Visit our educational website: headedanchorbolts.com for more specific information regarding technical details, specifications and grades, availability, manufacturing, and answers to frequently asked questions about headed anchor bolts. F1554: Hex or Heavy Hex?